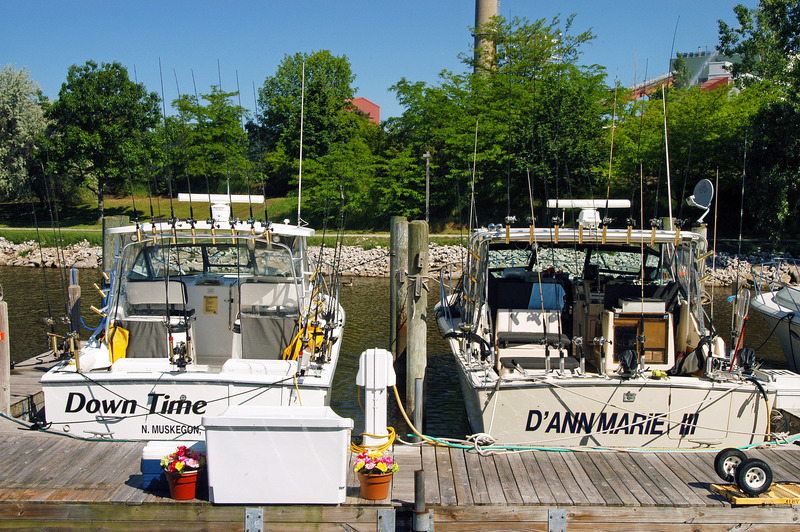 GRAND HAVEN, MI — Salmon fishing is defined a lot of different ways in Michigan. Much depends on who you talk with and their perspective. River guides are calling the 2013 fall run an “outstanding,” “banner,” or “great” season. They’ve been excited to see so many big salmon swimming up rivers this year. It’s good for business and clients like it. Meanwhile Lake Michigan charter captains seem to be less enthused. They’ve called it all sorts of things, both good and bad. Most were happy to see big fish, but salmon numbers were down. And so, to a surprising extent, is the sentiment of many. The difference is understandable. Charter captains have a longer season to finance, one that spans several months. They have their boats, their docks, their winter storage fees. Most will say their big market is Chinook salmon and many wish to sell limit catches (five salmon per person) all season long. They maintain it’s the numbers that count to keep a customer happy and returning. River guides, on the other hand, have a shorter salmon season. Their business is more diversified. 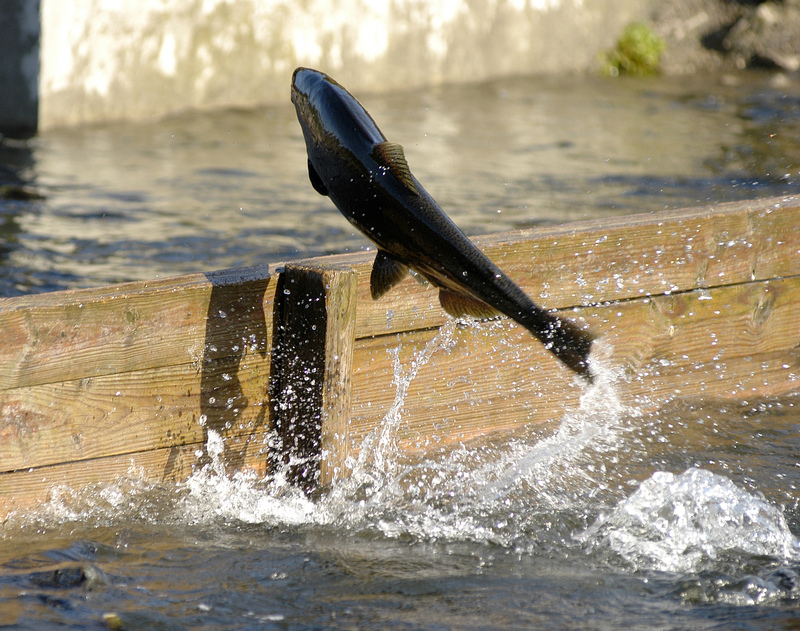 It begins when salmon converge on rivers in the fall. They sell a day on the water, the experience of finding, casting to and battling a big salmon if a client is so lucky as to hook-up and keep it on. Land two or three and their client is extremely happy. The rest of the year they sell trips for steelhead, trout, or maybe smallmouth bass. State officials say the salmon season has been all of the above. Mark Tonello, a Michigan Department of Natural Resources fish biologist out of Cadillac, recently addressed the members of the Lake Michigan Citizens Fishery Advisory Council. He presented the salmon weir returns for 2013. The weirs are where the DNR collects salmon eggs for the hatchery program. There are five located on strategic rivers where salmon run. The number collected is compared to other years which indicate any up or down trends. at Old Boys Brewhouse in Grand Haven. “The Chinooks were larger and we got a 31-pounder at the Little Manistee weir. It was the biggest fish of the fall (at the weirs). Tonello said the agency got all the eggs it needs for next year and then some. Chinook returns say lot about what’s happening in Lake Michigan. You may recall discussions earlier this year about declining prey fish and alewife numbers. Michigan and other Lake Michigan states moved to cut Chinook stocking by 50 percent this year to spread those limited food resources out. The result of those cuts won’t show up until next year and after. Preliminary results from acoustic sampling conducted this fall by the U.S. Geologic Survey on Lake Michigan found areas of Lake Michigan that had no prey fish, according to Tonello. And only two alewife year-classes were discovered elsewhere: one-year-olds and three-year-olds, basically one inch and three-inch fish. More data will be coming, Tonello said. The picture so far is incomplete. But what is known suggests more uncertainty ahead. DNR fall surveys of the 2013 salmon catch showed that three-year-old Chinooks dominated the sport and charter catch. Those were fish planted in or hatched in 2010. They had the luxury of an ample diet of alewives. What happens next may not be as good. The 2011 salmon year class made a poor showing, and the 2012 class were found just above average, Tonello said. Alewives are fish species that like heat, he explained. A warm year like 2012 was good for them. They grew well and were abundant. But this summer was cold by comparison, he said. “The prognosis for the 2013 year class (those fish planted this year) is probably not a great one,” Tonello said. But for all the prospective gloom and doom, Tonello was upbeat about other findings. Michigan’s Master Angler program is flush with Chinook salmon entries for the first time in a long time. There were 71 Chinook salmon entries as of the day he spoke the group. There were none in 2012 and very few for nearly a decade prior. The Betsie and Big Manistee rivers also had good runs of wild, naturally reproduced salmon. The top counties for Master Angler catches were Mason with 28 entries, Manistee with 19 and Benzie with 14 entries. From there it dropped to Oceana and Muskegon counties each with two entries and down to Grand Traverse, Charlevoix, Ottawa, Leelanau and Delta counties each with one. “The Delta County Master Angler entry was a 35-pounder,” Tonello said. Thirty five pounds is a giant salmon. To my way of thinking, things could have been a whole lot worse. This entry was posted in Uncategorized and tagged Chinook, Chinook Salmon, Conservation, DNR, Fishing, Grand Haven Michigan, Lake Michigan, Michigan Department of Natural Resources, Salmon. Bookmark the permalink.